There’s a lot that goes into planning an Adventure Weekend. There may be dozens of plotlines running at any given event. Your players will go through these plotlines, and through them, experience your chapter’s story and theme. Most LARP staffs have multiple writers all churning out material to create the weekend-long gaming experience. But how can you be sure you’ve covered all the bases? Multiple writers working on the same project often leave holes, gaps in the atmosphere which nobody addressed. For example, you may get to the end of an adventure weekend and realize there were a few groups that didn’t get to go on a module. Or that one particular story thread never made it to game-time at this event. Why does this happen? Sometimes you find that you are missing a resource necessary to the plot. An important NPC may have injured himself or missed the event. Maybe someone forgot to bring a certain costume, or a critical prop is missing. A lot of these things can be avoided by writing flexible plot – stories which don’t rely on one easily misplaced lynchpin. But these are operational concerns. This doesn’t account for holes that existed before the weekend even started. To help you organize your ideas and make sure they are all incorporated into the game, you might use a Plot Check List. A Plot Check List is a list of all the things that the plot is “about” at the event. As you and your staff writes for the event, check those ideas off the list. Items that are part of your event’s core theme should be checked off multiple times. 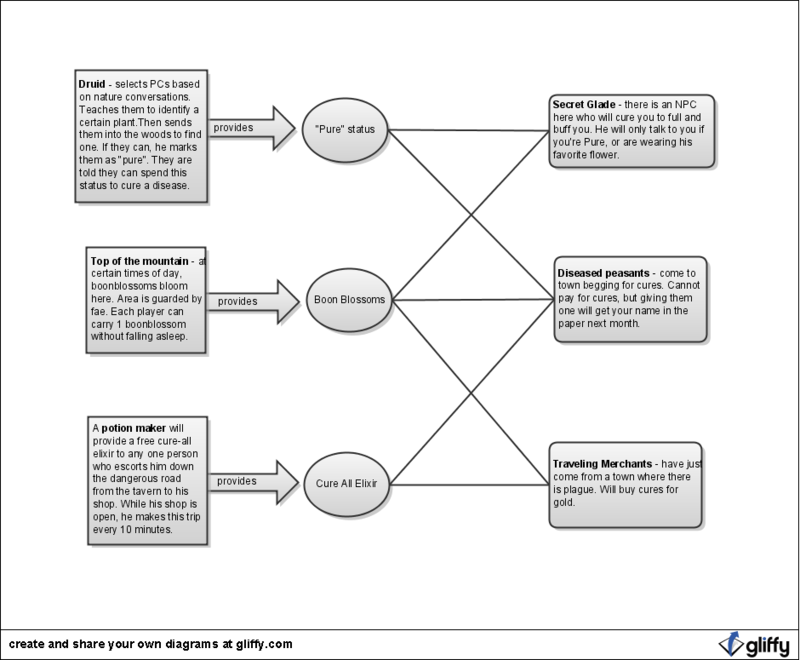 Teams – make sure each team is hooked directly into at least one plotline. In-game organizations like Guilds and Noble Courts should have at least one plotline per weekend which relates directly to their team concept. Levels – you can ensure that everybody has at least one well-scaled thing to do on the weekend by creating a module that you’re elligible for just by being a specific level. Run it once for players level 1-10, 11-20, 21-30, etc. Theme – the event’s theme should be reenforced during multiple plotlines. Some memorable themes are “Difficult Choices” and “Survival”. Elements, Fae, Transforms, Diplomacy, Exploration… recurring storylines become part of the chapter’s atmosphere. If you have a particular part of the game universe which is especially relevant to your chapter, make sure it’s included in each event’s script. Racial Plot – which game races get specific plot this weekend? Feedback from Event Surveys – what did the players ask for? Puzzles, role play encounters, certain types of plot… Make sure feedback is addressed by incorporating it into the plot checklist. You are currently browsing the archives for the Adventure Weekends category.